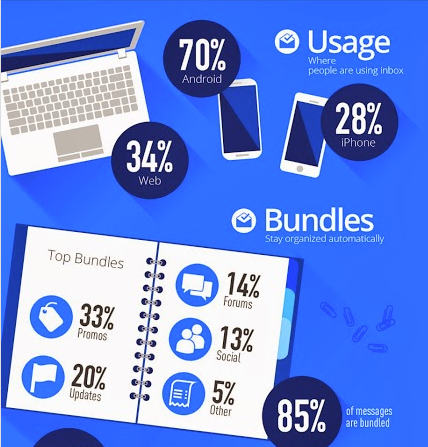 Earlier this week, researchers from Google shared an infographic showing some top line data on how and where recipients are using the new Inbox by Google to manage tasks based on their Gmail inbox. There are a couple of numbers in here that should make senders sit up and take notice. I am not myself a fan email-based task lists, because I have so many sources of tasks and projects that do not touch my mailbox(es). I prefer to use something like Evernote, which is a bit more agnostic about sourcing tasks. Nevertheless, I was completely wowed by the UX of Inbox by Google when it was introduced three months ago, and I can see how this could be extremely useful for certain types of email users. Most users access the app from their Android mobile devices – no surprise there. 85% of the messages landing in the inbox are thematically bundled by the app, which is far higher than I might have expected. The top bundle is Promos. That last point is pretty important to email marketers. It means that marketing messages are being set aside for users to manage separately from the rest of their mail flow. This is both good and bad news for senders. The good news is that, for this class of recipient, there’s less of a chance that your message will be interrupting their work flow. That may mean that recipients are getting around to your message when they’re ready to view it, and when they’ll be the most receptive to it. It may also mean they’re therefore less likely to unsubscribe from your list or – heaven forfend – report your permissioned mail as spam. I think you’ll find that when you do, engagement from recipients will improve whether they’re using Inbox by Google or not. This entry was posted in Deliverability and tagged Gmail, Inbox by Google. Bookmark the permalink.